Ultra Magnus "God Magnus "
Ultra Magnus transforms into a car carrier capable of transporting other Autobots such as the Autobot Brothers. 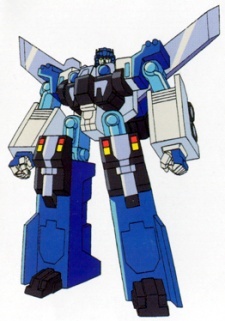 In addition to his remarkable strength and fighting ability, he is armed with the "Blue Bolts" - a variable-configuration weapon of immense destructive power. His weapon can either fire as a rapid fire gun or as a high powered laser. His back-mounted jetpack allows for periods of short flight.